Excel to vCard converter is faultless utility originally designed to Export Excel (XLS, XLSX) file contacts to vCard file format and supports three different vCard editions. The tool allows user to easily load heavy Excel file preview. 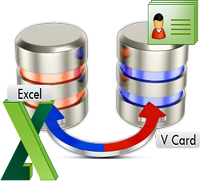 Excel to vCard converter software Export Excel file (XLS & XLSX) to vCard file format. Display previews- The tool displays preview of the entire Excel file before conversion of Excel file. User can export Excel file in 3 vCard (2.1, 3.0, & 4.0) Versions. Easily import converted vCard file in MS Outlook, & smart phone like Blackberry, iPhone, Android. The tool display lives conversion report if the user convert from XLS Contacts to VCF file. The demo version can convert all contacts, but will save the email addresses with: contact name and suffix '***Demo ***@Demo.com'. As far as contacts are concerned, it is difficult for Excel files to match the adeptness and versatility of vCard files. VCF files are easily supported a wide range of email platforms both; web based and desktop based, mobile phones, and gadgets of the present time for the storage of contacts. Meanwhile, Excel files are document files and are not amongst the supported formats by most applications' address book import. Excel file contacts can be recreated as vCard format files, however, it is quite inconvenient to generate a copy of vCard file using contact information stored in the Excel spreadsheet manually. In conditions like this, it is better to use a third party application instead. Excel to vCard Converter plays the role of such a mediator very well by serving the conversion of unlimited number of contacts into vCard format file. Why This Tool Is Globally Accepted? The best thing about this software is that it features two ways of generating vCard format output, i.e. an individual vCard file for each contact or a single vCard file for all the contacts. Moreover, you can also select the version of vCard in which you want the output to be generated. The software features three different versions of vCard, i.e. ; 2.1, 3.0 and 4.0 respectively. What are the system requirements to run this software? Minimum requirements: Processor: 1 GHz, RAM: 512 MB. The software can support Windows old versions? Yes, the software supports Windows 8, 8.1 and all below versions. Can I import all Excel file contacts into my phone? Yes, After Excel file conversion you can import contacts into Android, iPhone, etc.